Encore: Bron-Y-Aur Stomp, Rock and Roll. 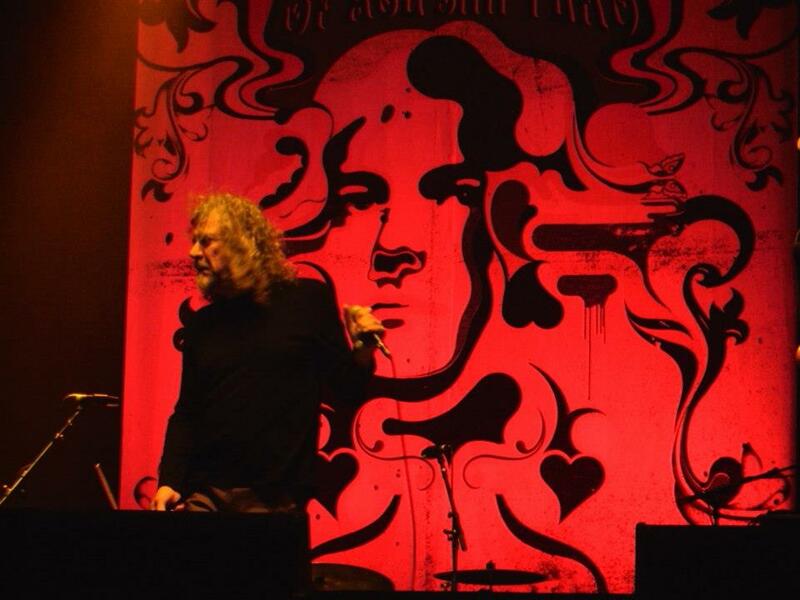 On stage this week at the Entertainment Centre, Robert Plant is relaxed and roguishly affable. He once looked like a Botticellian angel or a pre-Raphaelite prince. Now, with his long, crimped straw-coloured hair and Vandyke beard, he could be a Cavalier survivor from the court of James II. He is almost 65, and looking wrinkly – but every line in his face is a smile. He is charming from the first note, hunched over the microphone ready to release that big voice – now half an octave lower, perhaps – to an audience enthralled just to lay eyes on him. He opens with ‘Heartbreaker’ – from ‘Led Zeppelin II’. The vocals are wrapped in echo and reverb and the lyrics register as fragments – “…see how the fellas lay their money down …another guy’s name when I try to make love to you…Give it to me…Go away, Heartbreaker.“ The vocals are enveloped in the heavy rhythm sound of the Space Shifters – woozy, hypnotic keyboards, percussive drumming and thrumming guitar. No screaming Fender Telecaster leads, instead, an insistent, brooding bass and thud. Plant segues into ‘Tin Pan Valley’, its scathing satire on the life of retired celebrity mostly lost in the mix while everyone gets their bearings. It is the opening lines of ‘Ramble On’ – “Leaves are falling all around. It’s time I was on my way …” that registers with the crowd and the set begins to find its thread. Plant greets the punters and in his clipped, not-very-Midlands-anymore accent, announces ‘Another Tribe’. Guitarist Justin Adams lays out his acoustic riff, John Baggott generates the squelchy keyboards and Plant glides and sashays, upending the mike stand and expertly pitching his trademark vocals. He is a cool performer- no unbecoming Jaggerisms here. He is circumspect and restrained in his moves; it is like a courtly dance – all bows and scrapes and the gentlest self-irony. He is delivering the goods and having fun but nobody is pretending it’s 1974. Blues music was always central to Led Zeppelin, as to the Yardbirds, Stones, Animals and others who preceded them. On stage Plant invokes the names of Charlie Patton and Robert Johnson and the sixties blues revival performers Son House and Skip James. He describes them as Black Angels and muses on the fact that he is now the age they were when they were re-discovered and returned to the concert circuit. He doesn’t mention Willie Dixon whose family sued Zeppelin for its wholesale appropriation of his tunes and lyrics and were meagrely compensated in an out-of-court settlement. The Space Shifters chug into one of his most famous compositions all the same, ‘Spoonful’ – and it is one of several highlights of the night. West African musician Juldeh Camara joins the band onstage reminding us perhaps that the blues didn’t originate in the Delta but came from the continent where so many Africans were captured and transported. Camara adds his ritti, a single stringed African violin, to the insistent ‘Spoonful’ riff and later in the extended jam, Liam “Skin” Tyson’s spicy guitar is replaced by Camara’s distinctive kologa – an African form of the banjo. A cluster of big hits follows. ‘Black Dog’, with its instantly recognisable opening chords and blues bragger lyrics – “Hey mama, said the way you move, gonna make you sweat, gonna make you groove…” The band are in full form – but the force is in the drum and bass (the excellent Dave Smith and Billy Fuller) and, as in many songs, with bodhran, inventive keyboard fills and acoustic guitars. There are intense bursts of electricity from Tyson, but the effect is of thunderous skiffle. It is reminiscent of Bob Dylan’s electric string band from the ‘Modern Times’ tour. Not everyone is well pleased. Someone in the row behind me laments the absence of Jimmy Page. Certainly, there is none of his brilliant guitar flash, delivered as he languidly slouches against the Marshalls, lips curled into that Aleister Crowley sneer. But these Space Shifters have shape-shifted an old song and refreshed it – as they do, with Justin Adams on mandolin, in the melodic reading of ‘Going to California’ that follows. For the encore it is ‘Bron-Yr-Aur Stomp’ and, with Plant’s amiable intro – “Here is the answer to all things complicated: Simple!” – it is one last go-round with ‘Rock and Roll’. “Carry me back, baby…it’s been a long time, been a long time“. Yes, it has, and the faithful old trolls, as he jokingly called his sit-down audience, needed to hear the old refrains. However, Robert Plant and his Sensational Space Shifters not only gave us things borrowed and blue, they were also unexpected and refreshingly new.